Last Sunday, October 7, it felt like summer when Steve Tirone and I went looking for Armillaria in Schenley Park. We didn’t find any honey mushrooms but Steve found an amazing insect along the Beacon-Bartlett meadow trail. This praying mantis (possibly Tenodera sinensis) was not alone. When we paused to take photographs, we saw another mantis perched nearby and a third one flew away from us. Gigantic flying bug! Fall is mating time for praying mantises. The adults will die but their egg masses will survive the winter. Here’s what the egg sac looks like. Don’t take one home until you’ve read these Praying Mantis Egg Sac instructions. They will hatch in your house! 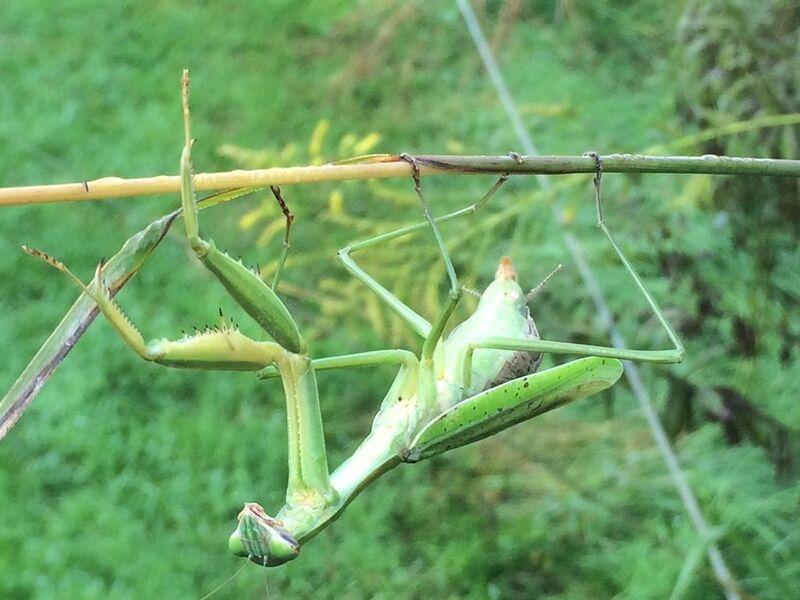 Last weekend was a busy time for praying mantises, hanging out in Schenley Park. Great photo – thanks for sharing! Yes I do love watching them too! So amazing to start out so small and then so big!!! Used to have them in my garden! 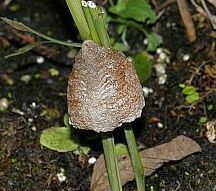 Definitely leave those praying mantis egg sacks – which look like brown styrofoam – alone! When I was a kid I brought one home and it hatched 200 ant-sized preying mantises all over my mother’s dining room curtains! We tried feeding them bologna, but they all died because it was the wrong time and place for them to hatch. I had no idea it was a preying mantis egg sack, I thought it would hatch a butterfly! I learned a most valuable lesson not to interfere with nature. Thanks for the post. I truly appreciate and am amazed by this bug. They’re so interesting and fun to watch! I had a batch of babies in my backyard a couple of years ago, I felt something crawling on me and when I looked down, it was a bunch of babies! Amazing. I’ll never forget it.